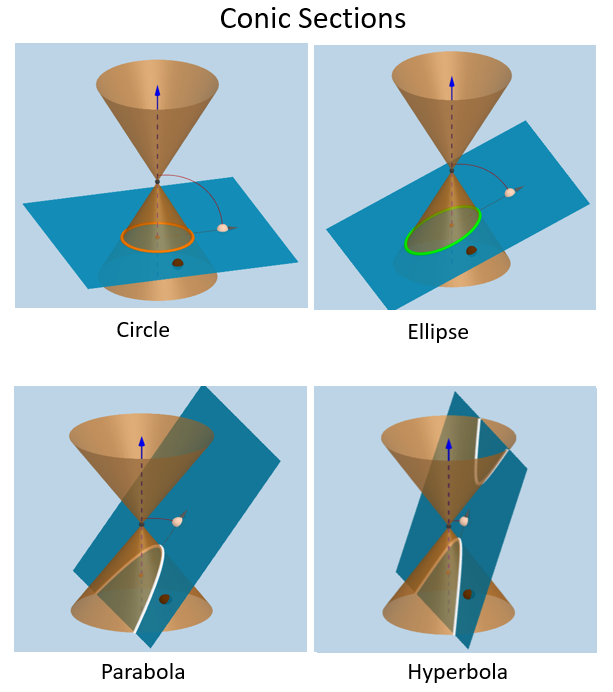 The following diagrams show the conic sections for circle, ellipse, parabola, and hyperbola. Scroll down the page for more examples and solutions on conic sections. How to generate a circle, ellipse, parabola, and hyperbola by intersecting a cone with a plane? Name each of the 4 conics. Demonstrate how the conics are formed by a plane and a cone. The fixed line is called the axis of the cone. The vertex is the point shared by both cones. The lines that pass through the vertex and form the cones are the generators. The generators lie in the cone. The cone consists of two parts called the nappes. A conic section section is a curve generated by intersecting a right circular cone with a plane. A circle is generated when the plane is perpendicular to the axis of the cone. An ellipse is generated when the plane is tilted so it intersects each generator, but only intersects one nappe. A parabola is generated when the plane is tilted so it is parallel to one generator and only intersects one nappe. A hyperbola is generated when the plane intersect both nappes. Defines a parabola and explains how to graph a parabola in standard form. Identify the key components to a parabola. Graph a parabola in standard form. How to graph a parabola given in general form by rewriting it in standard form? Write the general form of a parabola in standard form. A parabola is set of all points (x,y) that are equidistant from a fixed line called the directrix and a fixed point called the focus. Write the parabola in standard form and then graph. When working with circle conic sections, we can derive the equation of a circle by using coordinates and the distance formula. The equation of a circle is (x - h)2 + (y - k)2 = r2 where r is equal to the radius, and the coordinates (x,y) are equal to the circle center. The variables h and k represent horizontal or vertical shifts in the circle graph. 2. Write in standard form and then graph. How to talk about an ellipse? This video defines an ellipse and explains how to graph an ellipse in standard form. This video explains how to graph an ellipse in general form.